Safety has been a hot topic this year, and for good reason, with the number of deaths and serious injuries on our roads soaring. Turning the trend around has been a stated goal for both the government and Auckland. 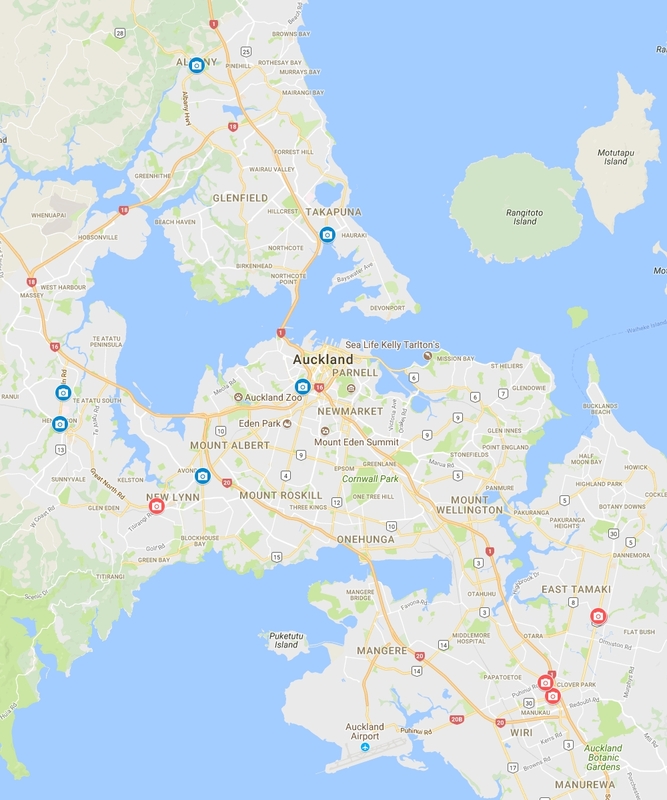 The Auckland Transport Alignment Project (ATAP) committed $900 million towards safety improvements, which was expected to see a 60% drop in deaths and serious injuries from 813 in 2017 to 325 in 2027. This is on top of other funding that should help improve safety, such as more cycling projects. This week, Auckland Transport have made three announcements about related to safety projects. It’s good to finally see some action after the damning safety report that was released in May that highlighted a culture within AT of not caring about safety. Six more red light cameras sites are being installed at high risk intersections in Auckland to reduce dangerous driving and help save lives. Great South Road and Cavendish Drive – two sites. Te Irirangi Drive and Accent Drive – two sites. Great North Road and Rata Street. Great South Road and Reagan Road. I created a quick map of the locations, blue spots are the first batch and the red the recently announced. It’s great to see more camera’s going in, and I assume they won’t take years to turn on like the first batch. But why only monitor six sites at a time? Given how prevalent red light running is all across the region, we’re going to need as much enforcement as possible. On Tuesday AT announced they were targeting improvements to more than 400km of rural roads. In the coming year $5 million, including funding from the new Regional Fuel Tax, will be spent on improved road markings and better signage. The work is part of Auckland Transport’s commitment to create a road network free of death and serious injury. In the past three years, deaths and serious injuries on Auckland roads have increased by more than 70 percent and just last year, 20 people were killed and 101 people were seriously injured on rural roads in the region. “That represents an appalling and unacceptable human cost. It also imposes social and economic costs”, says Mayor Phil Goff. In 2017, four roads, Hunua Road, Paparimu Road, Ararimu Road and Kariotahi Road, were improved as part of the project, known as the Signage and Delineation Plan. An evaluation showed a 40 per cent reduction in injury crashes along these corridors, with zero deaths or serious injuries reported since the work was completed. This seems to highlight just how cheap safety improvements can be, just $5 million for improvements to a lot of roads. A list of all the roads being improved is here. On Wednesday it was Glen Eden’s turn for an announcement with AT saying they want to make it safer safer for people walking around the centre and train station. The proposal includes upgrades to five existing pedestrian crossings along West Coast Road, the installation of a new speed table between Captain Scott Road and Bowers Road, an upgraded roundabout and pedestrian crossing facilities at the Captain Scott/Wilson/Oates Road intersection, and a reduction of traffic speeds to 30 km/h through Glen Eden town centre. “As part of our plans to revitalise the town centre, we want to make it safer and easier for people to get around, says Greg Presland, Waitākere Ranges Local Board Chair. Speed tables and a 30km/h speed limit sound like an improvement, although at peak times traffic is often doing less than that anyway. There are also new pedestrian crossings being added and a slip lane being removed. The map below shows where these will happen. There are more images and details on the AT page for the project. They’re also holding a consultation which closes 9-September. We look forward to seeing more safety announcements by AT in the coming weeks and months. Apparently the red light cameras can only be run by the Police, who don’t want to do the admin work for all the cameras. It is probably why we have only like half a working camera in the 10 years since the original successful trial. I’m assuming it wasn’t coincidence but public embarrassment of both AT/NZ Police to get the equipment working in the last few weeks. Can’t really have demerits on cameras. It’s the same reason why they don’t have demerits on Speed cameras. Its because they don’t always know whos in the car. So, we could have demerits on cameras, we just choose not to. Various Australian states do it – the demerit applies to the registered owner of the vehicle. If the owner wasn’t a driver, they nominate the driver. It’s an offence to falsely nominate a driver. In fact we already have a system in place to handle this, it is used when you get a fine from a speed camera but you weren’t driving the vehicle at the time. You make a statutory declaration to the police. I believe the rationale often used is that in relationships with a power imbalance, the weaker partner will be forced to take the demerits and thus possibly lose the license. Refusing an obvious mechanism like demerits for redlight running when we’re not doing much to restrict gambling, for example, shows that the priority here is on keeping personal freedoms for people in the positions of power rather than curtailing them to support the victims. Ive actually had somebody offer me money to take their Demerit Points before, in the UK. Didnt accept but I guess everybody has their price. I hardly ever drive so it wouldnt probably affect me. I’ve actually heard of people speeding away from the police when they try to pull them over, and they got away with it. Police were not able to catch them. We should probably get rid of road rules as they are unenforceable. Since we supposedly have all the organisations aligned on the need for improved safety, the police need to do better than just six more cameras, AT need to advocate for this, and the government need to ensure it’s funded. The media reported that “27 red light runners are ticketed by police in 45 minutes on the first day of a week-long sting outside Rangitoto College on the North Shore” shows how acute the problem is. I think the flow-on effects for more careful driving everywhere could be large. How ridiculous! Isn’t it like advertising which trains will have as ticket inspector? Surely if you only have 6 camera’s you want people to feel like they could be anywhere? And surely you want to gather as much revenue as possible so you can buy some more cameras? We’re talking about a puny dozen of cameras here. Somehow cities overseas are able to manage red light cameras on every major intersection. It’s almost like they have a minimum quotum for DSI over here. We needs to be a lot more red light cameras, this should be just the beginning. Seems the delay & lack of them partly due to the move to digital cameras (same as speed ones). Though not that great an excuse, is this correct? With the Police, so much focus has been on social related problems, so really just the older fashioned focus on traffic speed & drink driving is all that was left that they could cope with. All the while there has probably been increases in paper work loads I would guess. Yes need more traffic focussed staff assigned…people are dying just like they are from a murder down the street. What is the admin work? Camera takes photo, does number plate recognition, looks up license details, sends ticket. Lives saved. Or do they have little miniature police officers sitting in each camera box? Lots of false positives I presume. Someone pulls forward of the line and sets off the camera etc. If it takes multiple lanes, it takes time to work out who was offending. If anyone complains about it they phone in and take up admin time. If anyone challenges the ticket in court it takes up lots of time of that officer in court. Every camera could technically generate weeks of work within a few days. True. And all that admin is one more cost associated with the mode of driving. Peripherally related – I was driving between Dunedin and Queenstown in the last few days and noticed a lot more rumble strips being used both on the sides of the road and in the middle. This was very prevalent throughout the route (~250km) although not everywhere. I don’t know if these improvements are since the new government came in and announced a focus on safety or whether NZTA have been doing these in the background for a few years. I’m down there every year but don’t always drive the complete route I was on this year. No these predate the election, they’ve been progressively putting them in for years on routes where people keep falling asleep at the wheel. A good example of something really cheap that makes a significant dent in the crash rate. Motorway on ramp red lights could do with a rethink with regard to the culture of red light running. At moderate on ramp flows the lights are largely ignored. It can be argued that this is not a life and death issue so gung-ho NZ drivers & the mock bureaucracy that is traffic policing in NZ feels they can safely ignore the issue. However, when I can run a red light here with impunity maybe I can get away with it elsewhere so if on ramp red lights are to be treated differently maybe red isn’t the right colour. They could with a rethink, like being removed. They simply stuff traffic flows everywhere, ironically including SH16 to SH1 in the city, on NZTA’s own motorway, that serves to push cars to rat run through Freemans Bay. What really annoys me about them is where they are installed despite the on-ramp adding an extra lane to the motorway, such as from Grafton Gully to the Harbout Bridge link. No reason for those signals at all and they create huge delays. The level crossing at Glen Eden is the place money should be spent. Get rid of it! Its lethal and I have seen some incredibly near misses from pedestrians ignoring the lights/bells. And there is a school just up the road where little guys have to negotiate the tracks twice a day. And the thing is when the council go all speed tabley on us, it hinders emergency vehicles and that part of West Auckland is a very busy area for them, the police especially! Yes, the level crossing is the real problem. I also have seen many many close calls where pedestrians have been in near misses with trains. Just yesterday at 10am when a fast freight train came through there was a family with kids caught out by the pedestrian gates closing while they were centre of tracks. The kids were getting panicked in the refuge area, parent tried to calm them as fast approaching train thundered though the crossing. Thankfully the train driver did not sound horn otherwise kids may have run on to tracks. Options for removing level crossing look either impractical or expensive. But it does need to go as it’s an obvious accident waiting to happen. I’d suggest closing off road despite difficulty this means for fire station. Install a pedestrian walkway with lifts same as Middlemore Station. The existing footbridge appears to be a waste, does anyone ever use it? Remove it. It would cost money but safety always does and building this speed platform will cost a fortune anyway. My suggestion is divert Glenview Road around the back of the industrial buildings between the tracks and Waikumete Cemetery and have an intersection with Glendale Road utilising an over bridge for the cars. The short length of Glenview to West Coast Rd prohibits an over-bridge or a practical trench for the trains. Next, put in a subway under the tracks to the city bound platform or vice versa where the old level crossing was on Glenview. It would mean buying property/s for the new crossing but there is no other way around it. As it is the Glenview Rd rail crossing is a horribly risky place. I mean that is if AT are really serious about safety! https://i.imgur.com/oMWUfuV.png Yet in my example, it is a traffic calming measure and cannot serve as a crossing location as there are verges (often there are cultivated plantings) and cars parked. -people walking, looking along the road to see if they can find a place safer to cross. I have been in the situation of bothering to walk to what looked like a crossing only to find it was a muddy mess. Can’t AT do better than this, and just choose some standard differentiating devices from NZTA’s TCD manual and stick to them? How the flipping heck in this day and age did they leave out cycling provision from the Glen Eden plan? You could take a random stab at almost any AT or Council document and find a quote for how they will be providing cycling amenity, making cycling safer, reallocating road space, encouraging mode shift, making town centres copmfortable and accessible for active modes. It’s almost like there’s someone in AT who doesn’t like cycling. The AT Board might need to ensure Shane is working hard to locate the people with the cycling-hating blinkers on, as they are undermining everything the AT board, mayor, Council, Government and public are asking for. 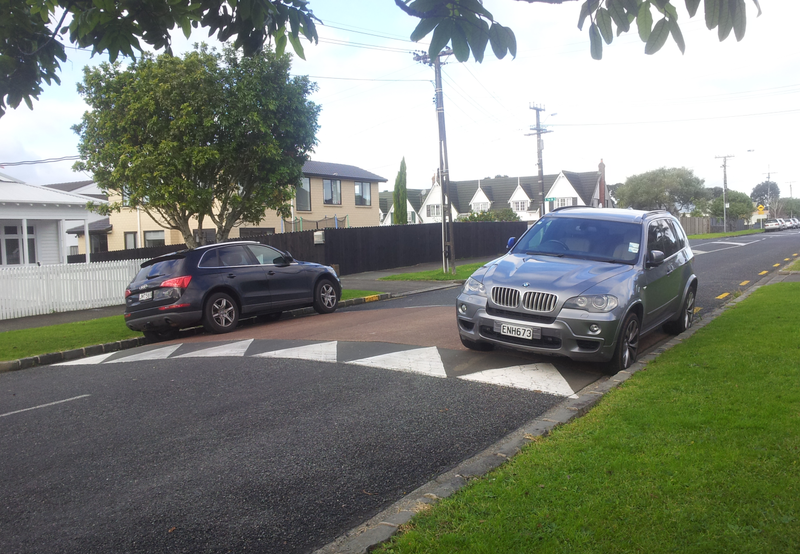 Having worked with AT on the Devonport cycling plan, their hearts are in the right place but they just don’t get it. Dealing with younger people is good but I spent most of my time laughing with them about the attitude of the older staff. When I went to a follow up meeting it was just painful. Everyone looking like deer in the headlights with us advocates being the only ones excited. They have the mechanisms and the toolkits to do it properly. The typology for this street requires cycling priority – the toolkit would only omit it if there was a suitable alternative provided, which this plan does not do. The cost of redoing the whole thing in a few years’ time when they’ve finally moved on the problem people is an ’emerging financial implication’ of not following the RASF. Here’s a crazy idea – what about building a cycleway along the side of the rail track from Henderson to New Lynn? 2.5m wide, with 1.6m fence between cycleway and rail. It would be a tight squeeze and need to circumvent the stations, but would be a fantastic addition to West Auckland. That’s ideal, but the streets need cycleways too. There is a long term intent for that, and it’s a key corridor for the whole of West Auckland, but it’s in the back of the queue as it’s not near the CBD. As James says, local streets need work as well. Agree, it’s a big omission. I could accept this as a temporary situation if a staged plan is coming, give that the reduction to 30kph will help cyclists, but give that there are quite a lot of interventions to kerb lines and drainage, and there is a reasonable amount of street parking being removed, it is hard to understand why no lanes are being added to West Coast Road through the village. I’m also slightly astounded that having recovered space from parking, AT think grass berms are appropriate in front of shops in a Town Centre environment. Welcome, delivery trucks! Just think how that will look after, oh, about 6 hours after completion. There’s space at the back of some of the premises for deliveries, it seems, on Glenmall Place, but good parking management would use those delivery parking spaces in a shared way, which will require AT working together well with property owners. Other than these private parking spots, there doesn’t seem to be much loading zone area there. And of course, it begs the question of whether the main town centre is on Westcoast Rd or in Glenmall Place. As it is, with AT refusing to enforce parking laws properly, the deliveries over the verges and footpaths will happen as you say, and not only will it cut up the verges, it’ll undo the pedestrian safety work they’re attempting. I think the delivery mode has missed out from this silo’d plan as much as the cycling and bus modes have. Poor safety team – they need to make changes, but are obviously unsupported by the strategy team. The RASF should have ensured the delivery mode, public transport and cycling were all better provided for than this. Again, what a waste of our rates when we have to go and fix it later. The “restrict front access” is a big AT thing, but I think this is only realistic in new urban areas. Trying to pull this off in existing centres and residential areas is difficult and not always a good objective. In GE, there is virtually no rear access, and a combination of levels, property ownership, and block depth make it near impossible to contemplate. As you say – there is a real question as to where the centre is. Glenmall is a creature of the ’60s, and is essentially a precursor to Botany-type layouts – large car park with shops around the edge. A pedestrian was killed in the space some years ago, which led to the speed humps etc that litter that space now (complete with “pedestrians give way” signs). For my money, the real centre is on West Coast Road – north-facing, higher on the ridge and not so much on the south-facing slope, on the movement rather than diverted to the side, and with the bus and train stops right there. Trying to promote the centre away from WCR is fighting the natural gravity of people’s movement all the way. From that point of view, civilising WCR is the right thing to do! And although I think the safety and amenity is critical, I would actually rather street parking was retained, and the through movement addressed more strongly. Removing the side friction of parked cars is only going to increase speed. I agree Heidi that the absence of cycleways is of concern. This proposal is for consultation purposes. There will be discussion between the local board and AT about how cycleways can be implemented and I am aware that the Captain Scott changes come from an original design commissioned by the local board that included cycleways. We (the local board) will want AT to pick up the tab for the cycleways, they will want us to use our limited resouces to pay for it. Hopefully we all end up at a happy place. “Urban arterial road and intersections are areas where severe crashes are common, and pedestrians are particularly at risk. Individuals, families and communities have been devastated by crashes, and we will not tolerate this contain loss of live and injury on Auckland roads. We are committed to working with the community to improve safety for everyone and ensuring that people have safe, accessible transport choices. Yes there are improvements around cycling but it is really refreshing and positive that very strong language around – AT will not tolerate this loss of live’ – this is really telling it those who may want to go against this project. – safety first. It’s great to see this from Auckland Transport, and it can only get better. I was wondering why there was a giveway sign in the garden. It looks like they are removing a slip lane but the photo manipulator person forgot the sign. 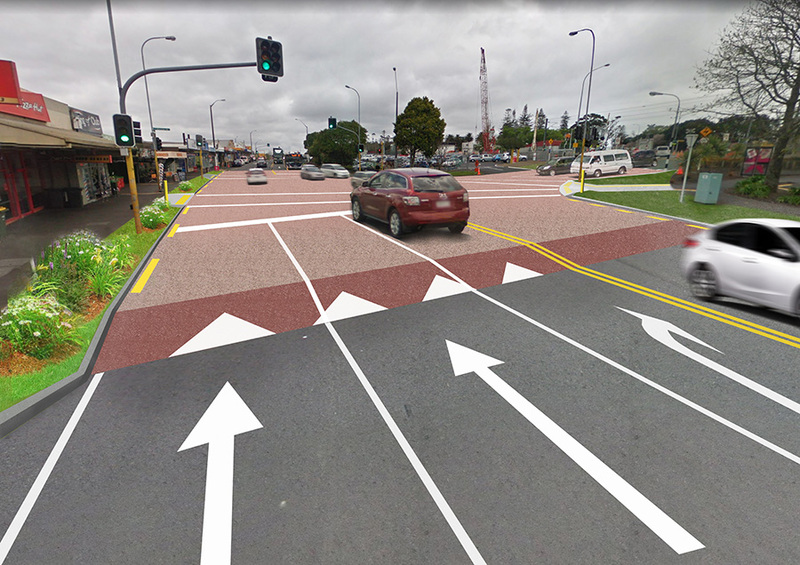 RE: Glen Eden – Even if the geometry was too tight for proper cycle lanes at the intersection, there’s heaps of room for cycle advance boxes. There must be some engineer working in AT who either hasn’t gotten around to reading the memo, or is simply carrying on with the status quo. Either way, their manager needs to be “encouraged” to ensure that all staff are working towards published G&Os in all their work. This smells like an example of a pressured environment or poor culture. In this particular example, I really would love to know how many people were directly responsible for this outcome. To me this Glen Eden looks exactly like what it is being billed at – a significant safety improvement, able to be done reasonably fast. AT’s safety people, while now suddenly having more money, still don’t have tons and tons of it. The bike people have NO money for projects outside their priority area (thanks to certain strategy department people having halved their proposed budget) and the RASF changes that would be expected for a town centre are pretty much totally unfunded too. But beyond that – even if the money was there – some of the changes people are throwing in here, like the closing or grade-separating of the underpass – would take years to plan and get approved. We have a road safety crisis now. Reducing the speed limit to 30 (if the supporting design of speed tables etc is not watered down) is a real safety gain. Compared to 50 kph, this reduces deaths and serious injuries by some 60-70%! That is a real, remarkable safety gain with all sorts of flow-on benefits for pedestrians and cyclists in particular. Something we have been asking for for ages. I can’t get angry at AT for proposing that kind of change, even if they are not doing it holistically like we would in a world with better funding frameworks and fewer legacy issues. Level crossing not underpass, obviously. As an effort to improve safety at Glen Eden these changes are positive. Problem is that this will likely mean no further progress to address the real issue of the dangerous level crossing and pedestrian crossing. When will safety be taken seriously, when people die at the crossing? “I can’t get angry at AT for proposing that kind of change”. The question is: how do we empower the people in AT trying to plant the trees, put in the bus and cycle lanes, apply traffic-reduction learning from the C40 cities, reallocate road space, make healthy streets? We’ve been promised all this in the Sustainability Framework, the Parks and Open Spaces Strategy, the Auckland Plan, etc yet we need to find a way to support the AT staff to stand up to the “certain strategy department people” who are going to cost us so much in lives, injuries, health, environment, social health. Let alone rates! I’m in agreement that there is lots of good stuff in this overall proposal. Lower speeds and an intent to create better pedestrian environment. Well done AT and Local Board who have been pushing for this and preparing plans which have helped it get this far. There are lots of elements that I think need attention, but that can go into the feedback. The lower speed zone is welcome. Can anyone please point out how they are changing the environment to support the lower speed zone in this picture: https://i.imgur.com/B1IEvjm.png I don’t see any, which is fantastic. If I’m right, then it seems that AT agree with me: we need lower posted speeds and enforcement of them. Most of our environments are in line with other countries’ lower urban speed environments, whereas the 50 km/hr limit has encouraged drivers to drive to that too-fast speed. Yep. 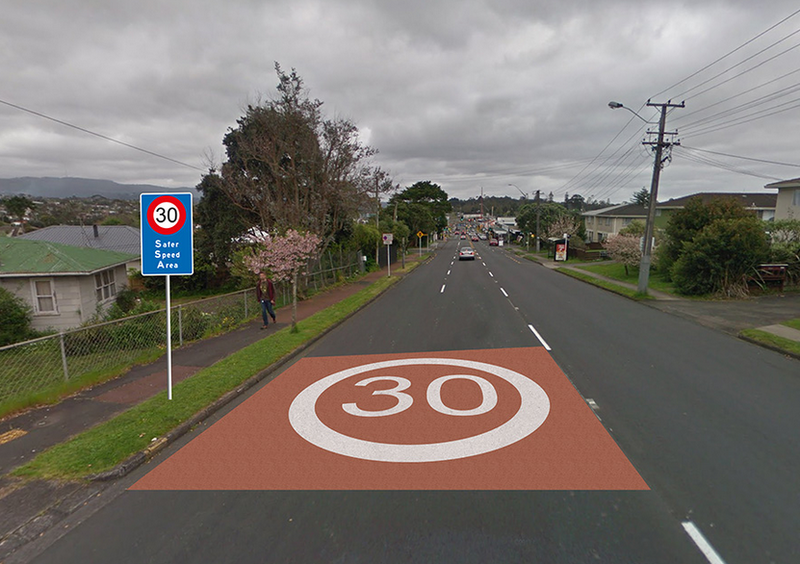 Make the NZ default urban speed limit 30 km/h, higher limits only for properly designed roads. I imagine the Local Board is hopping mad that their plans were so sorely ignored. Greg Presland, I suggest that if you care about supporting your constituents in their aims to be able to cycle safely to the shops, the train and the schools, that you take the issue up with AT and with the mayor until it is resolved. Good comment, but I think there is a reason for the (current) lack of Greenway integration. As far as I can tell, there’s an unhappy relationship between the proponents of the Greenways brand (AC Parks) and the Local Path Design Guide (AT Initiative, https://www.bikeauckland.org.nz/greenways-bike-boulevards-local-paths-aucklands-new-cycleway-guidelines/), both of which look to address walking and cycle provision (great! ), with the Parks team apparently feeling that AT is undermining their programme, and doing their best to block use of the Local Path approach in favour of the Greenways approach. I don’t know how AT have engaged in this situation, but I can’t help thinking that Parks are not the right people to lead connectivity and movement planning, especially if the situation I describe above turns out to be correct. That’s before we get to Parks’ active blocking of proposals to add lighting on paths in “unsafe” parks, an approach which I think is inexcusable in the context of needing to make moving around our city safer for women, children and indeed all other residents. Unfortunately, the Waitakere Greenways plan is also a jumble of green spaghetti thrown all over the map, at every possible opportunity, with insufficient rigour. I’m very much in favour of walking and cycling investment in the area, and there are some sound moves in there, but there is also a shopping list of projects that just feels bloated and ill considered. It would appear to me that if we want effective investment in our walking and cycling networks, there needs to be a much firmer hand directing coordination at the implementation stage as well as a clear decision taken on who is leading strategy and planning for walk + cycle networks. Personally, I think that should be AT for a whole raft of reasons, with Parks allocated an implementation responsibility. Thanks for that, Tim. I’m hoping that the appearance of coordination between these different agendas in my area is genuine – I think it is. I can see that AT would be the right organisation to be able to plan a network of active movement, but we have the problem of bias within AT against active modes, so it gets complicated. I agree the lighting issue hasn’t come to its full conclusion yet. Indeed passive surveillance needs to drive quite a lot of urban planning decision making. Thanks Heidi. The message that cycleways need to be an integral part of the changes is noted. And thanks for the mention of the draft greenways plan. It is not quite finalised yet but it is something we are proud of. The plan for Glen Eden shows the results of a silo’d approach. Buses, deliveries and cycling have all missed out, and the general thrust of safety improvements for pedestrians will be undermined by the inadequacy of provision for these other modes. Following the RASF properly would have avoided all this – it’s a toolkit of mechanisms to use rates most efficiently by allowing the progressive work being done in all the departments of Council and AT to be considered together. Any pressure you can apply to save the RASF and ensure it is used for every project would be fantastic. Cheers. Harry, you’re above this. Language is simply a means of communicating ideas. If you stayed up late writing articles as Matt does, your syntax might drop too. Life’s too short to be mean. so I guess I’m not supposed to comment about the complete lack of cycling amenities here? We got a similar flyer about safety changes to Three Kings. Again no cycling mentioned even though you would think Mt Albert Road would be an obvious corridor for cyclists. Good to see the new CEO seems to be at least saying the right or MORE right things than previously. Moving in the right direction, but needing to steer this big beast of an organisation will take some time to change. After I saw how our neighborhood grieve from the lost his brother who died in car accident in Auckland road, surely, road safety should be considered as a must to talk about. We just can’t let this slip through the cracks. After all we are paying our taxes for our government talk about this type of country matters.